You can book at Violetta Beauty Cottesloe online using our Book Now button located above. 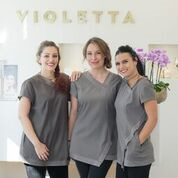 Select from a list of services offered, pick your favourite Violetta Beauty staff member and book from the dates available. Violetta Beauty is one of Perth’s most renowned and best loved advanced beauty and skin treatment salons. For over 26 years, we’ve cared for the skin and beauty needs of women and men in Claremont, Swanbourne, Cottesloe and surrounding areas. At Violetta, we are passionate about providing our clients with unrivalled personalised care, in an elegant, inviting and private salon. We deliver our comprehensive range of proven beauty treatments using state-of-the-art equipment and the world’s leading skincare products, enabling our highly trained therapists to achieve outstanding results. Our exceptional team comprises fully trained beauty therapists, skincare consultants and paramedical qualified experts. We strive to deliver the best results driven treatments in Perth ensuring all of our clients receive the highest level of satisfaction. The overall ranking and star rating is based on customer reviews received in the last 6 months. All customers that paid for a service at Violetta Beauty were requested to complete an independent review by mylocalsalon (a minimum of 26 reviews are required within the last 6 months to receive a ranking).